Start here to find thousands of books, media, and scholarly journal articles housed at Foley and available to you electronically. That returned 4,860,730 results in Primo Library Search! But if you login to Library Search, you'll unlock even more search results--click the Sign In link in the yellow bar, or the upper right hand corner. Then you'll have 4,963,573 results. Next, use filters on the left side of the screen to narrow your search to just Full Text Online items. You'll notice that your search results may include some streaming video, articles and other cool stuff! 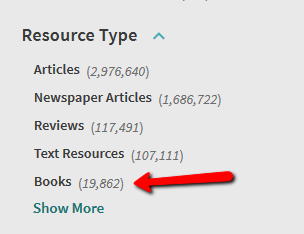 To narrow your results down to just eBooks, click the Books link in the "Resource Type" section of the filters. That's it! You've found some great eBooks you can read from anywhere--19,862! You know you've got it right if you have these limits listed to the left of your search results. Just click on Find Online to access your title. Happy eReading! If you can't find the material you need at Foley Library, check WorldCat, a database of titles from libraries worldwide. WorldCat allows you to locate your desired materials (books, movies, music, etc.) at other area libraries, or order them to be delivered to Gonzaga for free through our Interlibrary Loan service, ILLiad. OCLC's comprehensive catalog of books and resources held at tens of thousands of libraries around the world. Contains over 95 million bibliographic records. Use the 'Send request by ILLiad' feature to easily request items through Interlibrary Loan. The world is your library! Borrow items from the collections of thousands of libraries worldwide by using InterLibrary Loan through Foley Library!